The making of orthotics is as much art as technology. It is essential to perform a complete foot and ankle exam and check foot position prior to manufacturing of orthotics. The University Foot and Ankle Institute will perform a gait analysis and examination of the foot and then determine the proper type of orthotic based on your foot type, pathology, activity level and shoe type. The subject of orthotics is complex but there are some basic principles and examples that should give you an appreciation of their benefit. First of all, orthotics can be prefabricated (such as the Dr. Scholl’s products) or custom molded. The prefabricated (off the shelf) device gives added shock absorption but fails to control excessive motion and breaks down rather quickly. They are cheaper but tend to loose their benefit within 2 to 3 months versus custom orthotics that can last up to 2 years. Custom molded orthotics are made specifically for each individual patient’s foot. They are usually done with plaster molds. Particularly for complex and unusual foot shapes Plaster molds work better. We will evaluate your foot and decide which technique serves you best. Orthotics achieve foot comfort by changing the way forces act on the foot. In the flatfoot, there is a great deal of motion and some collapse of the arch with each step. This creates fatigue of the soft tissue structures and makes flatfooted individuals prone to conditions like tendinitis. 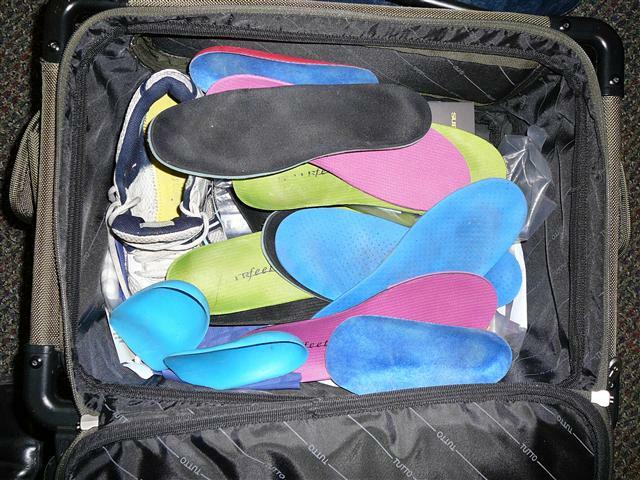 Orthotics help to control motion and collapse in these patients. Individuals with a high arch foot usually have a much more rigid foot structure but have limited contact with the ground. This creates areas of pinpoint pressure and the entire body weight is distributed through a relatively small part of the entire surface area of the foot. Consequently, a patient with a high arch is going to be prone to calluses, pressure points, and even stress fractures in an impact exercise program. Orthotics help these people by distributing body weight through a greater surface area and decreasing the shear stress (sliding in the shoe) of the foot in the shoe. What is the difference between the orthotics you can get at Costco versus the ones you get from a podiatrist. The Costco foot orthotics are fabricated from a weightbearing computer scan image of the feet. Unfortunately, the foot orthotics manufactured from such an image are not truly custom molded to a three-dimensional model of the foot. There is no intrinsic balancing of forefoot to rearfoot deformities with these devices. Therefore, true correction of alignment is not possible. Recently a mother brought her 10-year-old son into my office for a consultation. The mom had been shopping with her son at Costco several weeks earlier and saw the display for a custom pair of foot orthotics. She made the decision to buy a pair for her son, who had flat feet all his life. The mom had delayed taking her son to the doctor for an evaluation and this simple system of purchasing the foot orthotics at Costco seemed like an easy way out. With the Costco purchase, the mother ultimately wound up buying an $89 pair of arch supports. The devices did not fit her son and were uncomfortable to wear despite a three-week â€œbreak inâ€ period. There was no technician or qualified sales staff at Costco to modify or change the orthotic devices. The mother now realized that a better solution would be available from a qualified podiatrist. The negative experience at Costco had actually raised awareness about the possibilities of using foot orthotics to treat foot pain and had finally motivated this parent to make an appointment for his son. My evaluation confirmed a congenital Rigid pes planus deformity and after X-rays it was shown that the patient had a tarsal coalition. In this patient and I determined that the patient would benefit from resection of the coalition. After the patient had successful surgery he was molded for cutom orthotics. My office staff confirmed that the patient was a beneficiary of a medical insurance plan, which covered custom foot orthotics. The out-of-pocket expense for my custom devices was actually less than that of the Costco orthotics. The bottom line is that orthotics will only work when you have a proper diagnosis then you can select the proper orthotic to that diagnosis. The techs at costco and at other orthotic stores that don’t have a doctor on site can NOT make a diagnosis and cannot make the proper adjustments to the orthotics to address the biomechanical problem at hand.